Something funny happens to my spare time during the summer months. I have a million things on my to-do list and plans with dozens of people, but somehow I still manage to read. Let's just say my Kobo account on my iPad has seen plenty of action in the last few weeks. I've always had a soft spot for the Sisterhood of the Traveling Pants series, so you can imagine my curiosity and excitement when I saw the latest book, Sisterhood Everlasting, on Kobo's new releases page. 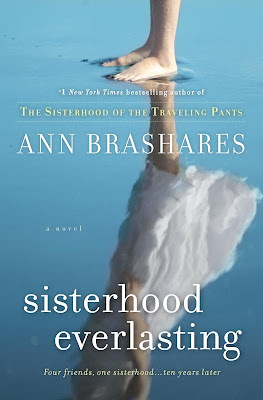 Ann Brashares resumes the story of lifelong best friends Tabitha, Bridget, Lena and Carmen ten years after the fourth "summer of the pants" in which the pants became lost forever. Without the magic of the pants to hold them together, and with the demands of their individual lives pulling them in different directions, the once strong sisterhood has become a shadow of its former self. Tabitha has married longtime boyfriend Brian and moved to Australia; her messages are intermittent before she drifts out of their lives completely for two years. Bridget lives with longtime beau Eric in San Francisco and feels herself settling down but growing restless. Carmen is a successful actress in New York, engaged to a man none of her friends like. Lena immerses herself in art and teaching at the Rhode Island School of Design, trying to forget her ill-fated relationship with the love of her life Kostos. Then mysterious messages arrive for the other three girls from Tabitha, who summons them to Greece for a reunion trip. An unexpected tragedy ensues, after which the sisterhood must grieve and figure out how they can move on. For fans of the series, Sisterhood Everlasting is a sequel that satisfies. Brashares writes with grace and self-assurance, her deft prose sketching out the quirks of each character with loving detail. Of the four girls in the sisterhood, my favourite has always been Lena. There may have been some heartache and a few tears on my part when things didn't work out between her and Kostos in the first four books. Here their relationship finally reaches the happy resolution both characters deserve. I'd love to see what happens to the girls at a later point in their lives, but if Sisterhood Everlasting is going to be the last book in the series, well, it certainly ties things up nicely. Whoa.. I totally didn't know this came out! I just gave away all my Sisterhood of the Traveling Pants series last week as I felt that I had outgrown them quite a few years ago. I'm definitely going to read this! I'm currently reading "The Boleyn Inheritance" by Philippa Gregory, an ongoing continuation of the story "The Other Boleyn Girl". Would definitely recommend if you haven't read. Anyway, I'm so excited to find this book and read it... even though I can't believe Lena is still hung up on Kostos :p Thanks for this review Lisa! Oh, I didn't know there was another one either! Mmm I haven't been doing as much reading as I'd liked. Working through a short story collection by Peter Beagle (author the last unicorn) which are delightful, strange, and somewhat sad. Hope they make a movie! So glad I came across your blog, Lisa - I've been loving the things you post! I just finished The Hunger Games series and I loved it. So engaging and full of detail. I am going to read this book after I finish Mini Shopaholic. I love the Sisterhood series and also the movies so I am quite excited to read this book and see how it all comes together.